On behalf of The Villages Mountain Gap Resort & Condominiums, thank you for considering this unique property to host your special event and congratulations on your engagement! The Mountain Gap Inn has a layout that resembles a small village. 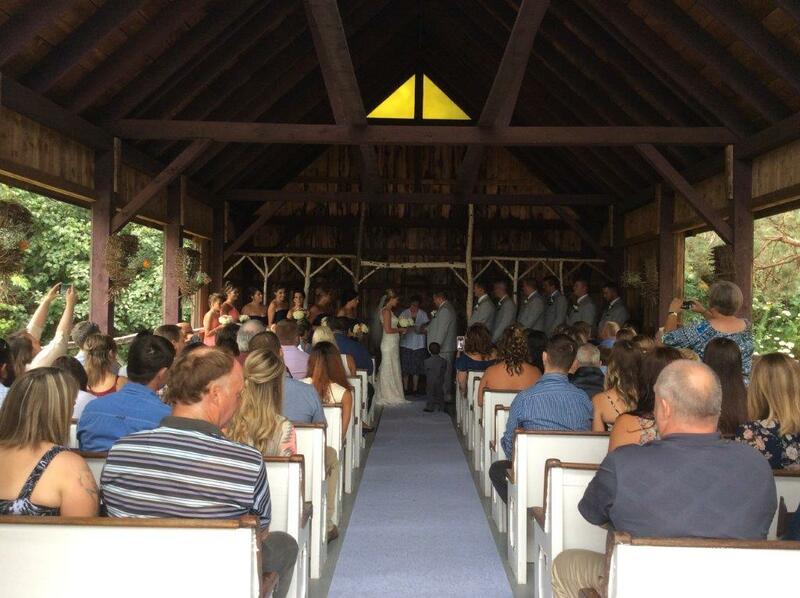 The Chapel is a special place that provides permanent seating for up to 100 people. The Chapel walls open up to let you enjoy the sea breeze and natural lighting. In addition, there are beautiful, spacious gardens and our private look-off provides incredible views of the Annapolis Basin and the "Gap"
A variety of guest accommodations can be found on the Mountain Gap Resort including but not limited to individual cottages and large complexes that contain as many as eighteen individual guest rooms. It can be arranged that your wedding guests' rooms be all located adjacent to one another. There are different locations that are ideal to host any of the events surrounding and including your special day. The smaller Annapolise Room is perfect for a rehearsal dinner or more intimate wedding reception, whilst the Diningroom offers a hardwood dance floor and separate bar set up to host larger dinners and receptions for up to 100 people. There are different wedding packages available to ensure you receive what you are looking for; including special room discounts for your wedding guests if 10 or more rooms are reserved. Thank you again for your interest in the Mountain Gap Inn and we are looking forward to working with you in the near future. Please advise our Special Functions Co-ordinator of the "Guaranteed Number" of guests to be served 72 hours prior to the function. For groups numbering 25 or under, the Guarantee Number is also the number of settings, which will be prepared in advance. For groups over 25, we will provide service and seating for 5% over the Guarantee Number. Minimum charges will be for the Guarantee Number. The Resort reserves the right to relocate functions to an alternate suitable location should the Guarantee Number fall below fifty percent (50%) of the original expected attendance. Our Chef can design menus to your specifications, including full attention to any special health or nutritional needs of your guests. Municipal and Provincial Health regulations governing our food service license require that all food served for your function be supplied by Mountain Gap Resort’s Kitchen and not from external sources or suppliers. We will be pleased to purchase and prepare any specialty items on your behalf. Wedding cakes are the only exception to this policy. Our beverage service licenses do not permit the service of beverage items supplied by external sources, including donations. All alcoholic beverages served in our function rooms must be supplied from regular Resort inventories. Payment on all accounts is net 30 days. For private parties and weddings, a non-refundable deposit of 10% of the estimated cost is required at the time of booking. Fifty percent (50%) of the estimated balance is due 30 days prior to the function. The remaining balance is required immediately following the function. Cancellations must be received at least 30 days prior to the scheduled event in order to avoid a cancellation fee of fifty percent (50%) of all charges. Cancellations not received within a 72- hour period will be subject to a cancellation fee of eighty percent (80%) of all charges.